Bring Back Our Blue Bridge! UPDATE: 11 October 2016. 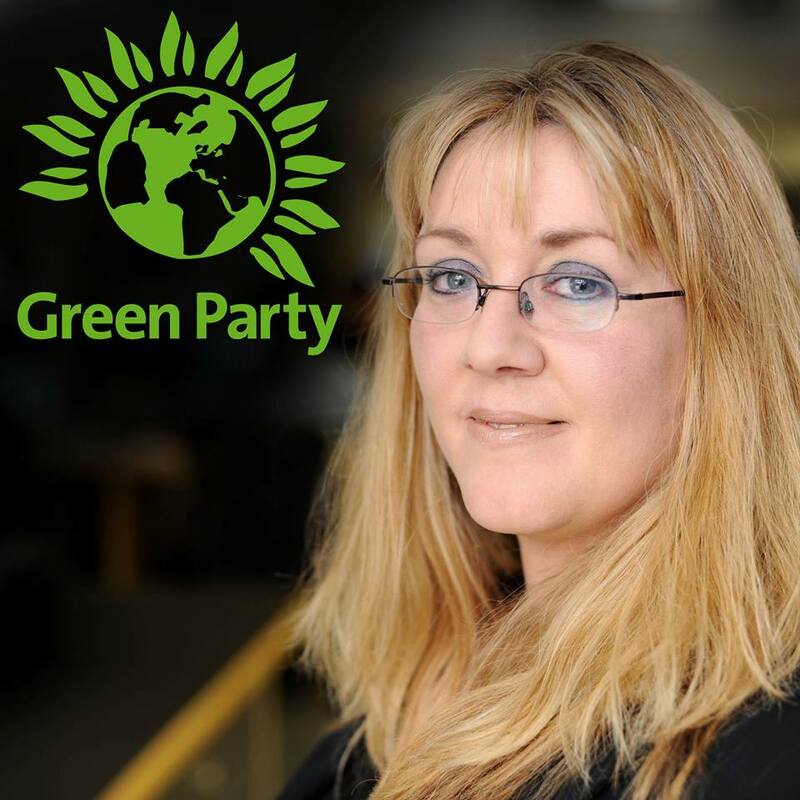 Peterborough City Council responds as follows: ‘The reason for using green is to try and standardise colours to help with covering graffiti (one tin of green paint can be used on numerous bridges). Also, grime and surface mould from trees etc. tend to stand out less on a green background’. So, sadly, it would seem our beloved blue bridge is green for good. While I know we'll all get used to it, what a shame Peterborough City Council didn't speak to residents before taking this decision. Who would have thought the colour of the railings on a Peterborough footbridge would mean so much to so many local residents. Peterborough City Council's decision to re-paint a bridge, known locally for decades 'The Blue Bridge' during safety improvement works has caused uproar. 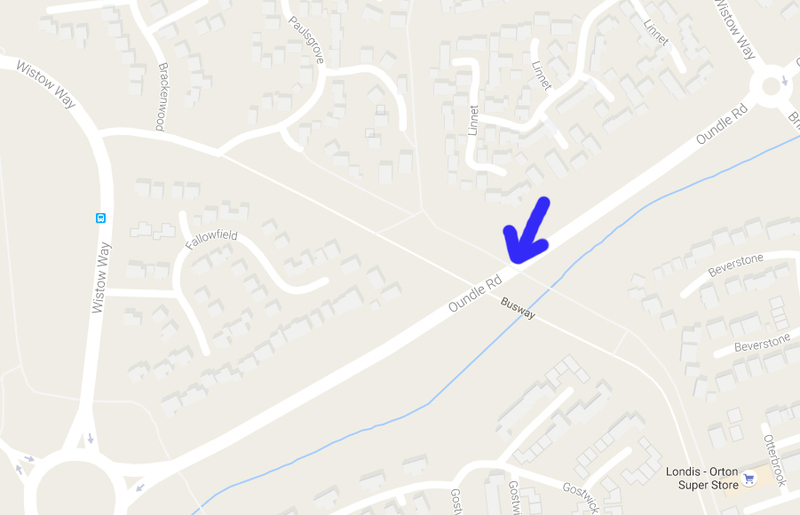 Spanning Oundle Road (also known as the A605), The Blue Bridge, provides pedestrian access between Orton Brimbles and Orton Wistow. But The Blue Bridge is no more. For reasons yet unknown, Peterborough City Council has painted the footbridge GREEN. While I'm all for a bit of green, this is The Blue Bridge and local people will continue to call it The Blue Bridge whatever colour the City Council paints it. Some residents are so annoyed by the colour change they have started a poll on Facebook to find out how other local people feel. The result is overwhelmingly in favour of turning The Blue Bridge blue again! At time of writing, 48 residents (plus me!) are in favour of painting the bridge blue again. Three people are happy for it to remain green, one person prefers pink and one person has another idea altogether. Who knew the colour of a footbridge would matter to so many people? Well, Peterborough City Council should have known for a start. Established communities often use colloquialisms to describe local landmarks. In London, this is very common. The Department of Health building in Whitehall is known as The Toaster (because it is shaped like a toaster). The Leadenhall Building is The Cheesegrater. 20 Fenchurch Street is the Walkie Talkie. And in Peteborough, the bridge over Oundle Road that connects Orton Brimbles to Orton Wistow is The Blue Bridge! 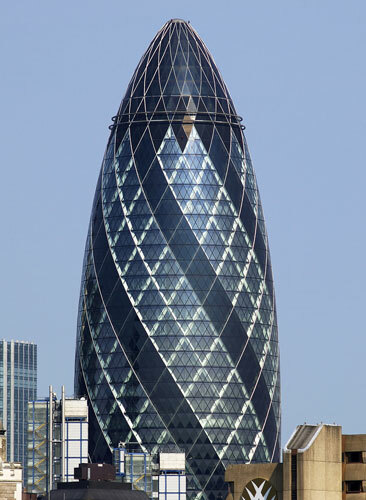 30 St Mary Axe is London is known as The Gherkin because of its shape. 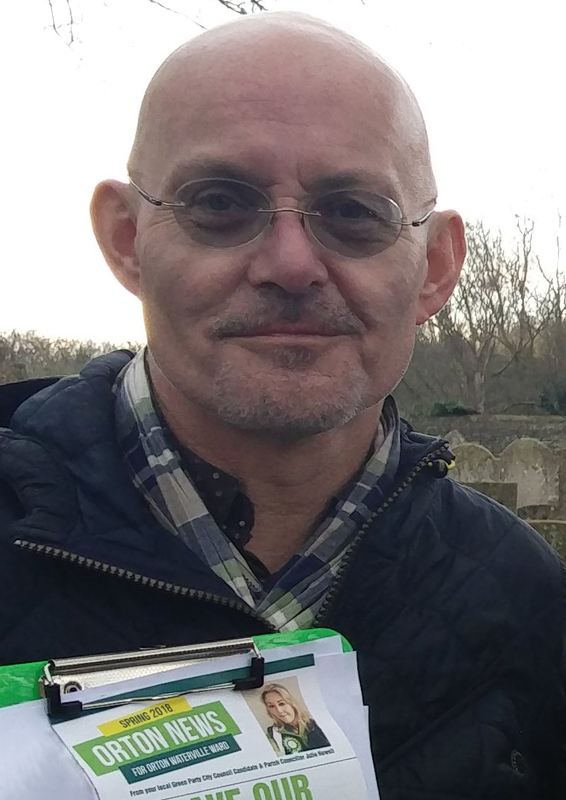 Communities should decide what local landmarks are called, and if a local landmark is so-called specifically because of the colour it has been painted, the City Council ought to be sensitive to residents' wishes (or at least provide an explanation for the colour change). We don't like messy graffiti in Orton, but we don't like this kind of cultural vandalism either! "I'll meet you by The Blue Bridge" and "You get there via The Blue Bridge" are turns of phrase oft-heard in Orton. If the City Council was sensitive to the community here, it would have known that turning The Blue Bridge green was likely to lead to frustration. The next time it's due a lick of paint here's hoping Peterborough City Council listens to residents' pleas and turns The Blue Bridge blue again! Peterborough is a city proud of its long history of household recycling. But poor town planning is making it unsafe. It's supposed to be simple. The roads are are for vehicles and the pavements are for people. We do things a little differently in Peterborough, but not that differently. Many of our pavements double as cycleways. This seems to work pretty well. I hear the odd complaint from residents when a cyclist has objected to a pedestrian being in their way (and vice versa, both should be looking out for one another). But on the whole, it works. What doesn't work is what I just observed from my window: a large Peterborough city council recycling lorry mounting the pavement and driving BACKWARDS along the shared cycleway to avoid parked cars, some of which are parked half on the shared cycleway/pavement and half on the road, making the cul-de-sac impassible by larger vehicles. You may think the residents are the ones at fault for parking without thinking about how lorries are supposed to access the houses on our street. But I don't blame our residents. What I just witnessed is the result of bad town planning. Visit most new housing estates in Peterborough and this is what you will see: cars parked half on the road, half on the pavement or cycleway. The plain fact is that most households have more cars than parking spaces. This is a contentious remark, however. There possibly would be enough parking for all vehicles if everyone parked their car in their garage. Very unfortunately, modern houses tend to offer far too little in the way of storage space, so many residents use their garage as an additional room for storing anything from furniture to fridges full of food. I've yet to meet a neighbour who keeps a car in their garage - have you? Admit it. 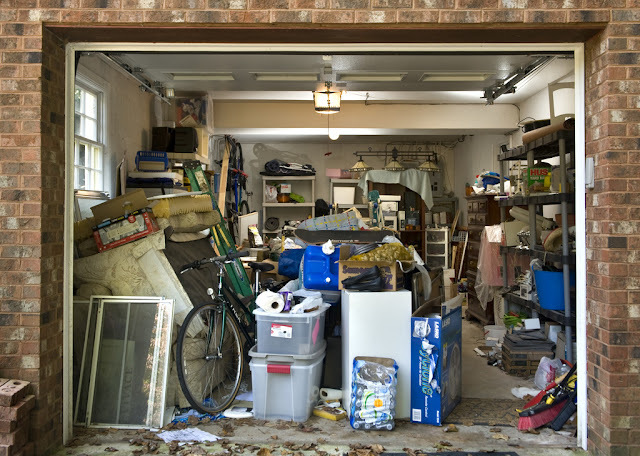 Your garage looks like this, doesn't it? Modern housing estate design isn't keeping up with modern living. How is a refuse lorry reversing at some speed up a cycleway in a modern residential street acceptable in 2016? I've already told you about the horrific cat-versus-vehicle incident that happened in my road late last year. The cycleway the refuse lorry was reversing up runs next to a playground for children aged under 12. How long will it be until there is an accident involving a small child? I'm not suggesting the council workers weren't being careful. 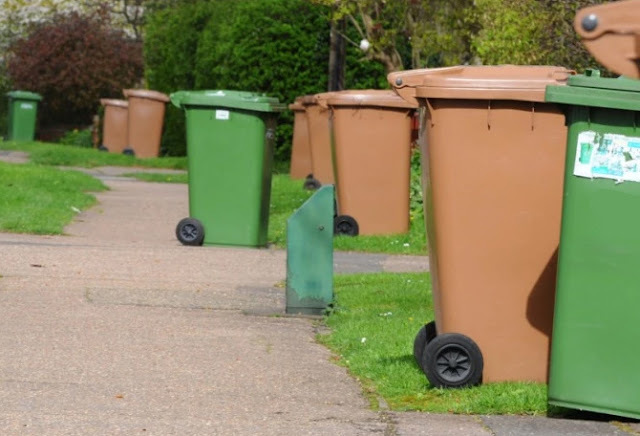 They were being as careful as they could be in the circumstances, although if they had driven away without emptying the rest of the bins on the street would it have been fair to blame them? We know from events elsewhere that refuse lorries should never, ever mount the pavement. Our streets should be safe. Our modern housing estates are not fit for purpose. The decision-makers who choose profit over safety may one day find themselves held to account for an accident that might have been avoided through better town planning. I should start by saying that I think this is fabulous. Simple ideas often are. 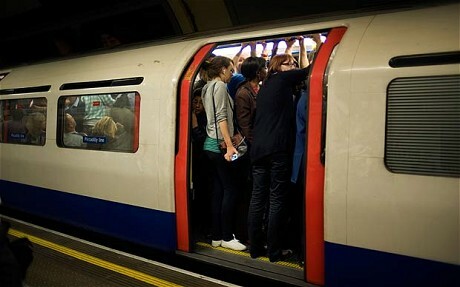 As reported by the BBC, Transport for London is trialling a new badge for customers who need a seat on the tube or bus because they have an 'invisible' disability or impairment that other people can't immediately see. Great. Perfect. Should have done this years ago. I love it. That said... I do have one problem with it. It may shock you, so brace yourself. As you may already know, I have multiple sclerosis (MS), first diagnosed when I was 19 (this is not the shocking part). 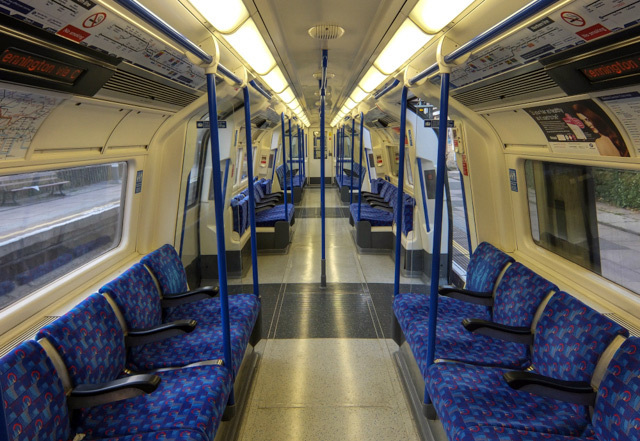 While lots of people with MS are going to love the new badge, it's actually the case that many of us don't want a seat on the tube (that's the shocking part!). Some of us have symptoms that you can't see by looking at us and, confusingly, these symptoms can mean we prefer to stand!! So what's that all about? Well, like many people with MS, I don't have trouble standing up per se. However, I do have trouble with vertigo. This has nothing to do with heights. It's a condition that makes me feel a bit dizzy, especially when I move from sitting to standing (ever stood up suddenly when you've been drinking and felt a bit unsteady? Well it's like that). So when I'm on the tube or on a bus it's far better for my comfort and safety and the safety of those around me if I stand - as long as I can hold onto a handrail. Why am I even mentioning this? When people see me on the tube they see a middle aged woman who they think probably wants a seat. So they offer me one and I politely decline. A seat doesn't help me, you see. It makes things worse. What I need to to be able to do is stand and hold onto a vertical handrail. Unfortunately, most people don't know about people like me and don't handle a public rejection too well. I've had people swear and shout at me when I've gently declined a seat that I didn't ask for or need. So these lovely new badges aren't of much help to me. But if I wore a badge that read 'Please DON'T offer me a seat' people would think I was ridiculing people who wear the other badge! You see what a minefield of political correctness living with an invisible disability can be! What people like me need is a badge that reads 'Please allow me to hold the handrail'. You would all understand that, wouldn't you? One of my bugbears when travelling on the tube or bus is when people lean against the vertical handrail (such people are usually immersed in a book), preventing me from getting a grip on it. If that's you, please stop it. I've learned that the best way to avoid problems is by avoiding busy trains. This sometimes means I arrive late for meetings, of course. I've also learned to stand with my legs apart and knees softly bent to help me to balance more easily. I've learned to work around everyone else, basically. This is what most people who live with invisible symptoms do. 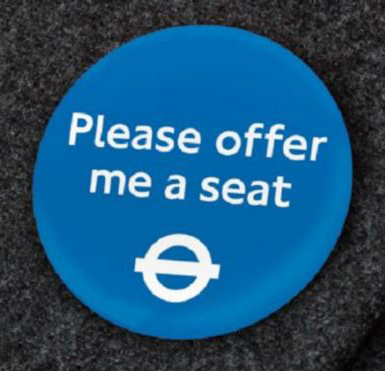 It seems like these badges are going to help people who need to sit on public transport and this pleases me greatly. Next stop, please help people who need to stand and hold the rail! 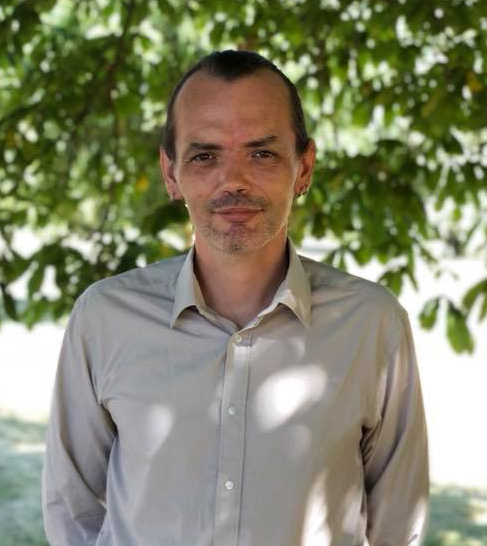 Disabled people and people with long term conditions vary. We need different things for different reasons. Above all else, we need people to listen to us when we tell you what we need, and please don't be offended if we decline the help you offer because it's not quite right for us. Many of us who live in Orton live in houses that weren't here 20, 40 or 60 years ago. I live in Orton Northgate, which is Orton's newest estate. So new, in fact, that it's still not finished and has yet to be adopted by Peterborough City Council. Orton Northgate sits on what used to be Peterborough Showground land. Construction on the estate began over a decade ago. I remember it well, as I worked for RNIB in Orton Southgate at the time. I can literally look out of my window today and say 'I remember when this was all fields!'. 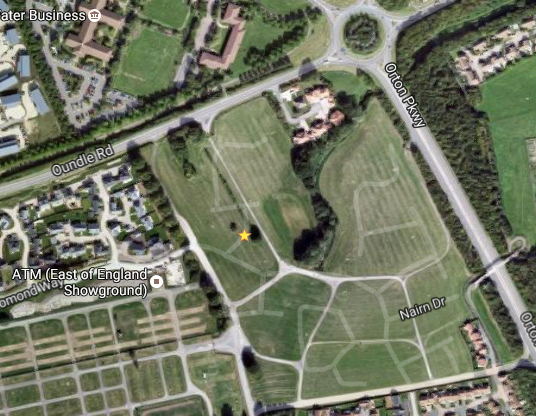 (And GoogleMaps thinks it's still a field!). Google thinks I live in a field! A few years ago, I lived on the Sugar Way estate in Woodston. Again, I was in a house that was less than ten years old, on a new housing estate that was still under construction, on land that was previously home to sugar beat and wildlife. When these estates were planned, the developers and the council had to adhere to guidelines regarding how the building of the housing schemes would affect the area's natural biodiversity. In other words, you don't just build over natural habitats that are rich in wildlife. Great care must taken to ensure that the wide diversity of creatures that also call Peterborough their home can continue to thrive. This is a complicated business, far more complex than most of us realise (See Cambridgeshire & Peterborough Biodiversity Partnership). Even after all the work is done and the houses have been standing for a number of years you come to realise that some of the local wildlife 'didn't get the memo' and haven't properly moved out. I wonder how many Orton residents have found that their house is home to more species than just the human, feline and canine (and in some cases avian, rodent, reptile and arachnid!). I've been unwittingly entertaining a number of very special guests this summer, and I'd like you to meet them. I was watching the TV one evening in June, when I noticed movement in the empty dog basket on the other side of the room. My immediate thought was 'uh-oh, mice'. Perhaps one of the cats had brought a live mouse into the house and put it into the dog's basket 'as a gift'. But when I looked closer I was relieved (and very surprised) to discover that this was not a mouse, but a huge adult frog. Although he was found in the dog's basket, I don't believe any of my resident pets brought him in. It seems more likely that he hopped in from the garden via the kitchen door when I wasn't looking. What a beauty! I have always loved frogs so I was very pleased to meet this one. 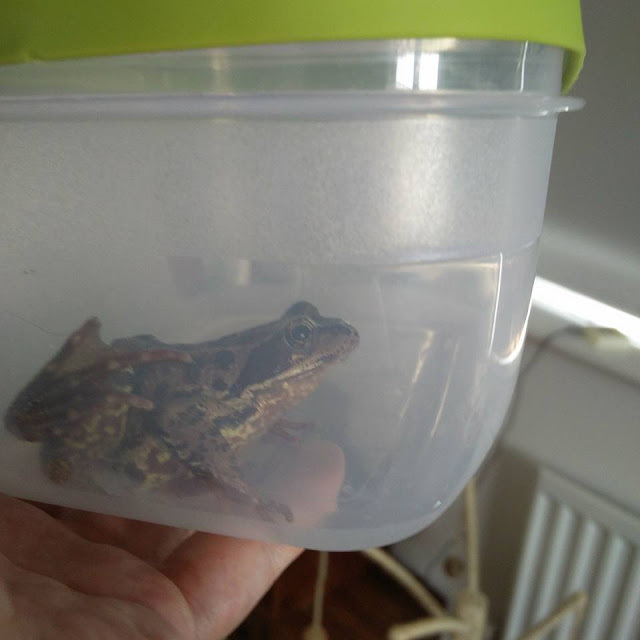 I took him outside and released him in some long grass in the garden. I've never seen one of these before. 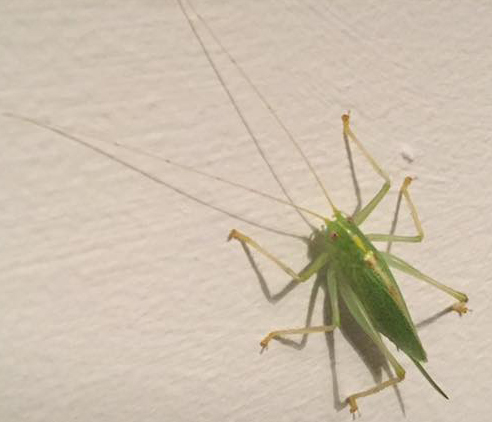 I spotted him on a bedroom wall. At first glance I assumed he was a grasshopper (it's green, it hops). However, he's not a grasshopper at all. He's a type of cricket. This is an oak bush-cricket. According to Wildlife Trusts, they can usually be found in the canopy of mature trees and feed on small insects, so this one must have take a wrong turn to end up in a house. I took this picture and then released him outside. Have you ever seen anything like this?! Even her shadow is awesome! If you're not keen on creepy crawlies you may wish to click away now! The ichneumon wasp is one of the family of 'parasitic' wasps. This means she lays her eggs inside other living insects. So if you ever see an ichneumon wasp perched on top of another insect you now know what she's doing there! When the eggs hatch they eat the host alive - gross. But don't hate the ichneumon wasp too much - they play an important role in removing pests from our environment. 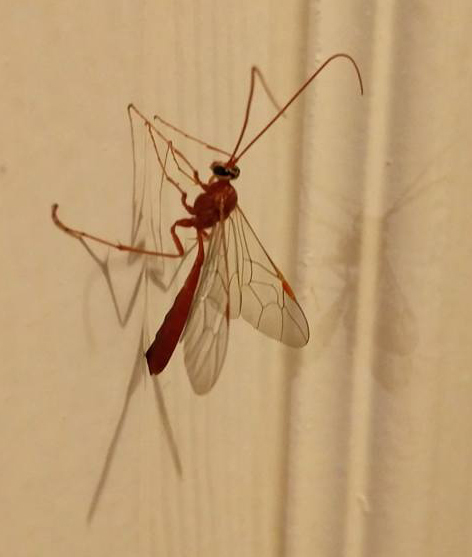 There are 2,500 different species of ichneumon wasps - but I'm pretty sure this is the first one I've ever seen. Amazing. These are just three of the unexpected visitors that have been found in my house in the past few months. Have you been visited by any of these interesting insects or amphibians lately, or anything completely different? For more information on how to identify small creatures and what to do if you find anything like these in your home, visit Wildlife Trusts, BugLife and FrogLife.